Little, Brown Spark, 9780316380102, 320pp. The bestselling author of Grain Brain uncovers the powerful role of gut bacteria in determining your brain's destiny. Debilitating brain disorders are on the rise-from children diagnosed with autism and ADHD to adults developing dementia at younger ages than ever before. But a medical revolution is underway that can solve this problem: Astonishing new research is revealing that the health of your brain is, to an extraordinary degree, dictated by the state of your microbiome - the vast population of organisms that live in your body and outnumber your own cells ten to one. What's taking place in your intestines today is determining your risk for any number of brain-related conditions. 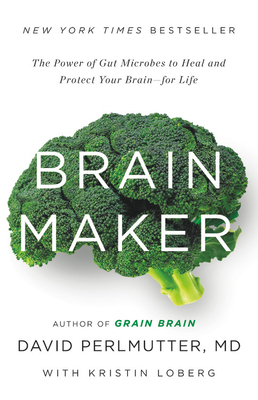 In BRAIN MAKER, Dr. Perlmutter explains the potent interplay between intestinal microbes and the brain, describing how the microbiome develops from birth and evolves based on lifestyle choices, how it can become "sick," and how nurturing gut health through a few easy strategies can alter your brain's destiny for the better. With simple dietary recommendations and a highly practical program of six steps to improving gut ecology, BRAIN MAKER opens the door to unprecedented brain health potential. David Perlmutter, MD, is a board-certified neurologist and a Fellow of the American College of Nutrition. He is the recipient of the Linus Pauling Award and the author of the #1 New York Times bestseller Grain Brain as well as The Grain Brain Cookbook, The Better Brain Book, and Raise a Smarter Child by Kindergarten. He lives and practices in Naples, Florida.